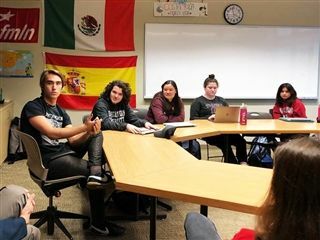 Jonah Gercke '17 visited AP Spanish students to discuss the filming of a documentary about how the political and economic collapse of Venezuela is affecting its citizens. Discussing the importance of the global travel program, Jonah said, "Pacific Ridge’s global travel program was insanely influential for me. The more young people have opportunities to travel, especially before they get to college, the better. It makes you a better citizen of the world."